When U.S. 61 was the main thoroughfare through Muscatine it was designed and built for cars and traffic. It was a roadway for traffic to move from one side of Muscatine to the other as quickly and efficiently as possible without any consideration of the places and destinations in between the entry and exit points of Muscatine. Although traffic was cut in half by the opening of the U.S. 61 by-pass in 1985, the newly designated Business 61 continued on as a thoroughfare for moving from one end of Muscatine to the other with only the brief hesitations for traffic lights. The Grandview Avenue and Mississippi Drive corridors began to suffer under the cars and traffic philosophy as businesses closed or moved to more desirable locations as traffic kept passing them by, and residents sought more desirable locations to live. Mississippi Drive began to crumble under the weight of persistent Mississippi River flooding and a decaying substructure that made even the simplest of repairs proved to be cost prohibitive. Plenty of evidence was gathered that confirmed that the roadway needed to be completely renovated even with the reduced amount of traffic, and that merged with an idea and a vision that had sprung up from the renovations being undertaken at Riverside Park. Riverside Park has gone through two renovations (plans for a third are now on the drawing board) as the riverfront was transformed from a railroad switch yard and a declining business district to the envy of most river towns up and down the Mississippi River. 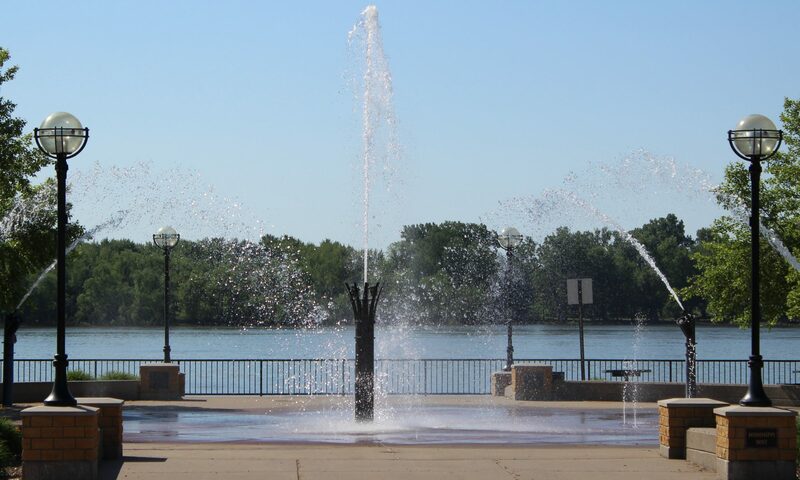 This park is becoming the place that people want to visit when they come to Muscatine and what better way to promote this Gateway to Muscatine than to connect it to the Downtown Business District utilizing a revitalized Mississippi Drive. Placemaking is the concept of planning cities with people and places in mind instead of cars and traffic. It is not a new concept but it is one that has been gaining steam especially with movement towards the promotion of healthier lifestyles and the development of communities and neighborhoods that are walkable. Placemaking also promotes the idea that public spaces are the heart of a community. Riverside Park is a destination that gives Muscatine both an identity and an image from which new investment, new businesses, and new residents are attracted to come, shop, stay, and live. Riverside Park is not the only destination in Muscatine but it is one of the most prominent. The investment into the park deserves an investment into the connections to that park such as an updated Mississippi Drive and the revitalization of the downtown business district. The revitalization of the downtown area is already underway with new businesses opening, buildings being renovated, and apartments are remodeled and rented or leased to those who seek the urban lifestyle with a small town feel. When Muscatine successfully negotiated the transfer of jurisdiction of Mississippi Drive (the old Business 61) in 2015 the opportunity presented itself to design a corridor that would blend well with and provide a solid connection between the riverfront and the downtown area. Urban writer and activist Jane Jacobs (1916-2006) said that cities have the capability of providing something for everybody, only because, and only when, they are created by everybody. The City of Muscatine, along with the engineers from the design team, understood that message and launched the largest public outreach campaign ever attempted by the municipality. Through numerous public meetings and informational sessions with the City Council, a plan came into focus that highlighted the natural beauty of the park with landscaped medians and highlighted the convenience of the shops, restaurants, and an urban living lifestyle of the downtown with sidewalks and crosswalks that enhanced the safety of pedestrians. The Mississippi Drive Corridor Project thus became more than just another city project, it became a project of the citizens of Muscatine. The plan was developed through the vast amount of input from citizens and businesses with an eye on the required elements from the federal government (which is funding the project). That vision is now becoming a reality with the portion from Iowa Avenue to Broadway completed except for a few finishing touches that were left to complete when winter shut down the project. What Muscatine will have when the project is completed later this year is a corridor that features a downtown area that is accessible and well connected to the green space of Riverside Park, a corridor that projects the positive image of a Muscatine full of promise for a better future, a corridor that attracts people to stop, shop, eat, and participate in the various activities, and a corridor that helps create a social environment that people want to come back to time and time again. The Mississippi Drive Corridor Reconstruction Project is much more than just replacing a worn out four-lane highway, it is about creating and promoting Muscatine as a GREAT PLACE. It is about replacing the final images of an industrial riverfront with the image of a community rekindling the vital social interactions of people and places that have gone missing in recent years. It is about replacing the focus on cars and traffic with a focus on the people and places that make a community great. And that, after all, is what we want most. A great place to live, work, play, and raise a family.